It's so easy to picture you, out on the grill. Every summer. Dressed in the basic tenets of dad-chic: sunglasses lassoed around the bend of your neck, white socks pulled to their breaking point over white New Balances, gym shorts far, far outside the zone of acceptable gym shorts-wear. Various degrees of hat. Over the flames, beers were drank. Belches were had by the mouthful. Puns were scattered with reckless abandon. 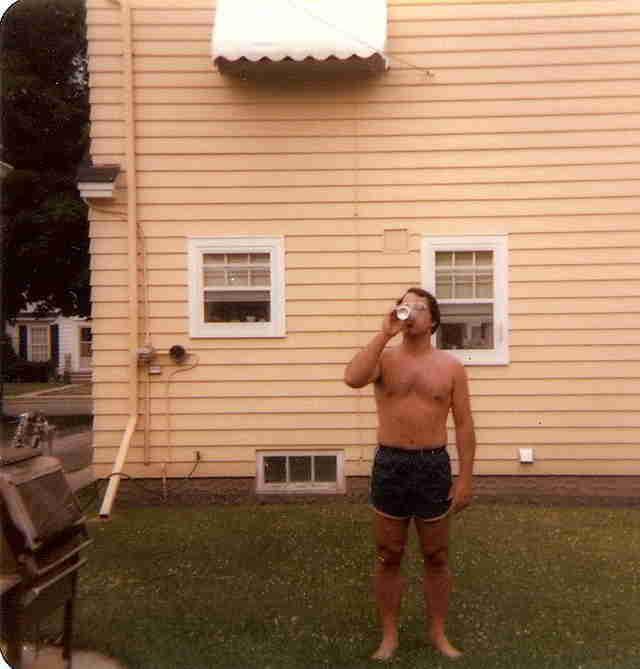 Alcohol, fire, and meat have a tendency to turn even the sternest dadfolk into a slightly poorer man's Tim Allen. It's OK. This was your time. Your element. And it was always kind of glorious. Maybe you worked late during the week. It's commonplace that school-night dinners were spearheaded by a spouse or partner, or portioned out by strangers in takeout boxes and inhaled around the glow of Seinfeld reruns. But when you hopped on the grill, it was like Bruce Lee entering a cast-iron dojo. Ali hopping in a ring of lighter fluid and char. Every kid assumed you could flip the most potent cheeseburger in the world, just as every kid knew you could out-arm-wrestle the mightiest of all the other kids' dads at the lunch table. You would twirl your spatula and rhyme every word you could with spatula and pretend to be ingesting said spatula (orifice of choice dependent on audience age) before mom or the neighbors told you to please, for the love of God, stop. But when you told us you were the grilling champion of the world, we listened. We bought it. We never even considered that it may not be true. And in that way, it was true. More than golf. More than recliner chairs. More than baseball and Rick Reilly columns and watching Arnold Schwarzenegger blow up a composite of type-cast, vaguely foreign villains twice a summer -- the grill is the epicenter of You. The ground zero for dad-dom. It's the best kind of reliable spontaneity. It's like a snow day every lazy Sunday. It's the dad, in his natural habitat. You showed us how to season a steak. 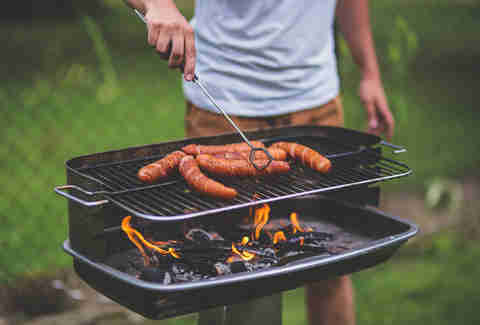 How to put flame lines on a weenie, and to make sure your veggies don't slip through the grates. The act of grilling is the modern-day version of raising a barn with your kin, or building a ship in a bottle -- but it takes a fraction of the time and involves more BBQ sauce. And to your credit, you never let the experience drown in machismo. You showed your daughters how to do it just as well, if not better, than the boys. The grill remains the domain of dads, but will always appeal to kids, with or without a Y chromosome. Food is the universal line of communication, especially when peppered with dad jokes about flame lines on weenies. Smell is the sense most tied to memory. It's hard for us to inhale the burning coals of charcoal or the wafting clouds of backyard cheeseburger without remembering you, your grill, and the twilights when the magic-hour sunlight swam around the smoke and the skewers were plated as the porch lights came on. You sat down at the table, and told us to dig in. Then, it seemed hard to imagine a greater grilling hero than you. Then we started getting older. We realized that Fred's dad could probably beat you in an arm wrestle... he was a Marine. We sort of decided you aren't the best burger chef in the world after we tried Shake Shack. I'm sorry if we never told you any of this, but one day, we figured out you aren't Superman. Even if you do own the same underpants… and once changed clothes in a phone booth. We realized, inevitably, you aren't perfect. We worshipped you in childhood, ignored or rebelled against you as teens, and as adults, we realized that those days out there were about so much more than dinner. We got to see you as a person, to catch a glimpse of what you were like, before dad-dom grabbed you by the sack and turned you into a responsible guardian. Eventually, we realized, dad is kind of cool. 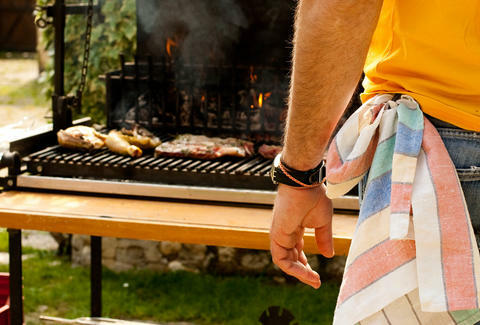 The truth is, if we are lucky enough to still be able to see you now -- hunched over a grill, making the same punny jabs and blackened burgers -- we should consider ourselves lucky. Maybe your socks (and pants) are a little higher. Maybe we need to speak a little louder when we're talking to you. Maybe the jokes are even more antiquated than they were 20 years ago ("weenie" is funny at any age). But that wasn't important to us then. And it's not important to us now. So much of cooking is rooted in the mistakes; meals made better by embracing imperfections instead of living within their limits -- especially out in the elements and on the grill. Burned edges don't mean a broken dish. They add character. The same goes for you, dad. You aren't Superman. You aren't perfect. But you've always been there -- on summer nights with a soundtrack of crickets and radio baseball, and everywhere in between. And now, we can truly appreciate it. So, we want to say thanks. To you, the grilling champion of the world. Wil Fulton is a staff writer for Thrillist. Follow him: @wilfulton.